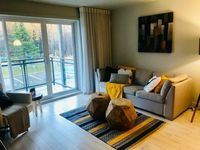 Properties in Mont-Sainte-Anne average 4.7 out of 5 stars. Maison de rêve deluxe, au bord du fleuve. River view, deluxe dream house. 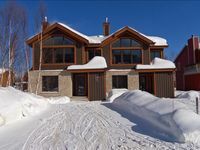 Property 4: Maison de rêve deluxe, au bord du fleuve. River view, deluxe dream house. Property 5: Studio with a magnificent view on the mountain. Property 6: A little piece of paradise by the St. Lawrence River. Property 38: 4 1/2 mezzanine in a quiet place. The house is just a minute drive from the resort. It's very clean and very well equipped. There is all you need to enjoy your stay. Great location and close to ski hill. Would come again. There was ample room for the five of us (two adults and three chilidren). Our kids loved swimming in the on-site pool (never busy). The beds were very comfortable. The kitchen, though small, had all the required items, including pots and pans, utensils, etc.